It's been a long while since I last updated my blog. In the meantime, it's certainly NOT cold anymore - but very hot!! We as family were traveling a lot back and forth between Geneva and Stuttgart (southern Germany). Beside our duties, we had fun discovering my home area in a new way. On Mother's Day we went to Stuttgart's hugest park: The beautiful "Schlossgarten". and at the end of the day made a trip to Stuttgart's television tower "Fernsehturm". Stuttgart is not only economically strong and home of big companies like Mercedes, Porsche and Bosch, but also became a very urban, modern big city over the last decades - with lots of culture and a high quality of life. It's surrounded by vineyards, forests and a lot of green space to spend leisure time. It was real winter around here the first half of February. It snowed a lot on the 31st of January and then the weather became really cold - minus 10 degrees (14 Fahrenheit) was no exception. The advantage of the cold temperatures was certainly that the snow stayed and our son had fun in the snow! Our local newspaper, Tribune de Genève, put a beautiful winter photo gallery online. On the 11th February we went to the medieval French town of Yvoire which is located on the South bank of Geneva Lake. We went to the waterside where an icy wind was blowing. The wind and the temperature, in combination with the water of the lake, had iced the laterns which looked very impressive (see below). In the meantime, the weather is milder and the sun is melting the last ice and snow in our parks. I'm thankful that we had real winter -and now I'm actually looking forward to spring!!! We got to know PAUL in the South of France ... a lovely bakery chain with delicious bread, cakes and all kinds of treats. It took us a while to find PAUL in our area. We went there again during Christmas time and enjoyed delicious coffee, quiche and marvellous desserts. I had a praliné macaron which was the best macaron I've ever eaten (see second pic above)! What we also like about PAUL is the interior design - it is like stepping back into good old times, with chandeliers, walls covered with old library cabinets with tiny drawers - and the waitresses/sales clerks are also dressed like in the first half of the 20th century! You can check the website PAUL - they have shops/cafés not only in France, but also in around twenty other countries. ... with one of my favourite Christmas songs "Do you hear what I hear? ", performed by Carrie Underwood at the NYC Rockefeller Center. Enjoy and have a wonderful Christmas time, celebrating the birth of Jesus Christ, our saviour! From Geneva, we drive 4 - 5 hours to the South of France and so we went there already several times since we live here. In August, we went to Nice which is a modern city, a magnet for tourists and a truly beautiful place! A city full of life. Famous is also the Promenade d'Anglais that goes along all the famous beaches and hotels. If you plan to visit Nice, then don't miss the markets - you find flowers, soaps, spicery, vegetables, fruit and simply all kind of things. 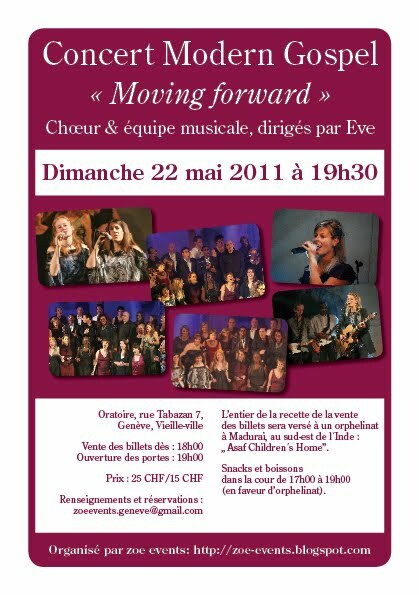 Modern Gospel Concert "Moving Forward"! We will have our 2nd Modern Gospel Concert, "Moving Forward", this coming Sunday! You can listen to some songs on our zoe events blog and also have a look at the flyers above! It is a charity concert where all proceeds will go to Asaf Children's Home, an orphanage in Madurai/India. 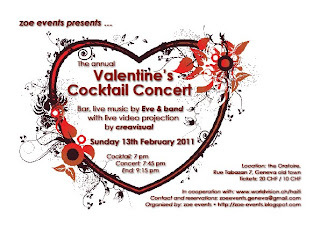 We'll be having our annual zoe events Valentine's Cocktail Concert on Sun 13th Feb 2011 this year! Please check the flyers in English and French above. 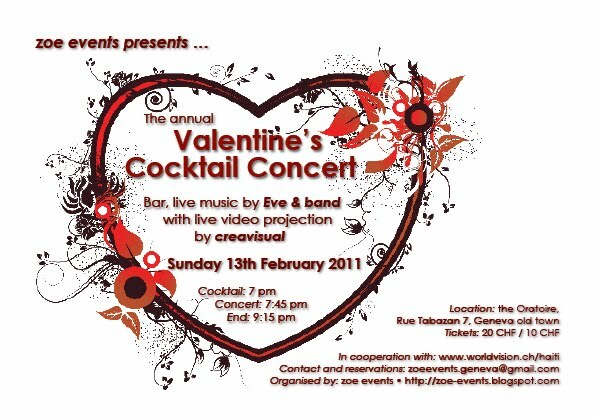 We'll be having a cocktail, then love songs in pop-rock style and video live projection! 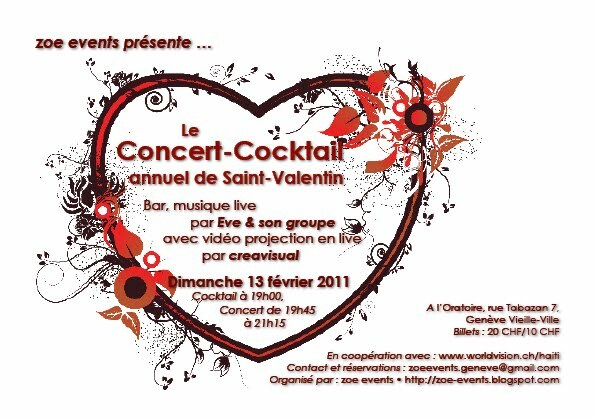 This will be a fun evening for couples, families and singles (yes, we have also every year some singles who come and enjoy the event!!). It's our third Valentine's Concert and preparation is in full swing! We are also more than happy to announce that we cooperate again with World Vision for Haiti!! The concert is also an official event of the Marriage Week here in Switzerland! After seven years in Geneva/French speaking Switzerland, my husband, son and I moved to Stuttgart area. This is the area of my childhood and youth. I know many places already, but there is so much to rediscover and to discover for the first time: towns, forests, lakes, restaurants, cafés and Stuttgart's urban life.